I remember when Michelle Obama met the Queen for the first time, there was all this talk about her breaking the protocol by bearing her shoulders...big woooop. So last week Michelle came back and she was bearing her shoulders not once but twice :). 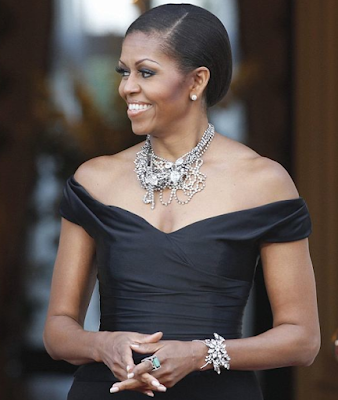 I love Michelle's bold fashion statements and absolutely adore her Black Ralph Lauren gown paired with Tom Binns necklace. She is, no doubt, the first lady of fashion!